From Jimi's use of a vibe on "Machine Gun" to the tone-defining wah work on "Voodoo Child," modulation was always a big part of his tonal palette. 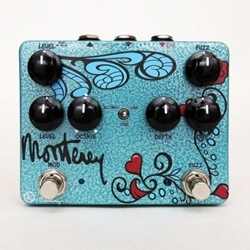 The Monterey packs all of those sounds into this one pedal, and it does so with quality and detail in mind. The rotary speaker sound uses cabinet simulation for a life-like feel, and the vibe effect is as deep and lush as you could ever want. Or utilize the Monterey's autowah tones for an open and detailed filter that takes you back to the electric guitar's golden years.The fuzz circuit onboard the Monterey Rotary Fuzz Vibe multi-effects pedal is based on the two-transistor fuzz sound that Jimi used to great effect on songs like "Foxey Lady" and "Star Spangled Banner." The fuzz's tone is warm and round but with enough top end to stay clear and punchy in a mix. Sweetwater players enjoy this kind of fuzz for how well it cleans up when you play lighter or roll the volume knob back on your guitar. This circuit nails that feature giving you any shade of gain you desire whether using single-coils or humbuckers.Keeley crammed even more features into the Monterey in addition to all of the gain and modulation options it already has. A variable octave knob blends in either an octave up or an octave down as you turn the control. This is wonderful for paring with the fuzz for an octavia-type of tone. The Monterey also works well as a speaker cabinet simulator if you turn on the rotary effect but stop the rate of rotation. And as if that weren't enough, an Expression pedal input offers you real-time control over modulation rate and the wah tones.